"Where Private Community Living is Quality Living"
There may be other units within the community that are for sale by owner and not listed here. 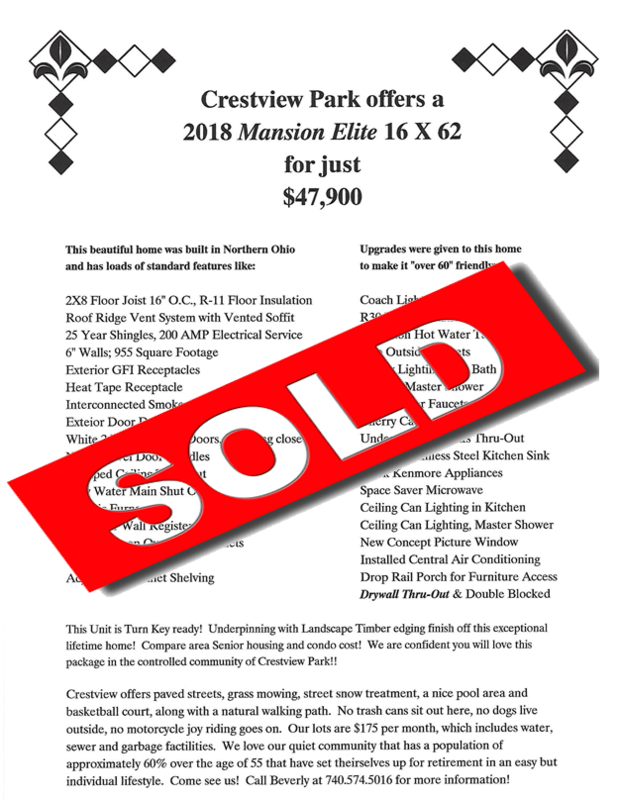 Our residents typically place a "For Sale " sign in the front window and may give the office a flyer to post in the office window. Please drive thru or call the office for information on these homes. Because we are a large community, it would be best to check often as homes sell quickly. All prospective buyers must pick up a Lot Application and Criminal Background Check paperwork BEFORE purchasing a home to keep here. When buying a home to move out of Crestview, the buyer must notify the manager within one business day of those intentions and supply an address and appropriate phone number and identification, also. The manager is required to notify the State of movement of any mobile home into and out of Crestview property.